Neutron activation analysis is a highly sensitive analytical technique used in determining trace amounts of elements present in a given sample. However, it usually requires a strong enough neutron source such as research reactors or neutron generating accelerators. In the absence of such neutron generating facilities, the utilization of small isotopic neutron sources may be feasible depending on the strength of the source and the target material for detection. To determine the potential of an unused 239Pu-Be isotopic neutron source in the Philippine Nuclear Research Institute for neutron activation analysis, we assessed the source for detection of gold samples. Gamma rays from gold emitted after neutron irradiation were measured by a gamma scintillation detector. The detection limit obtained was 22 μg/g. This shows the importance of this type of source for developing neutron activation analysis in countries without neutron generating facilities. F. Hila, C. A. Dingle, J. F. Jecong, R. Olivares, and N. R. Guillermo. 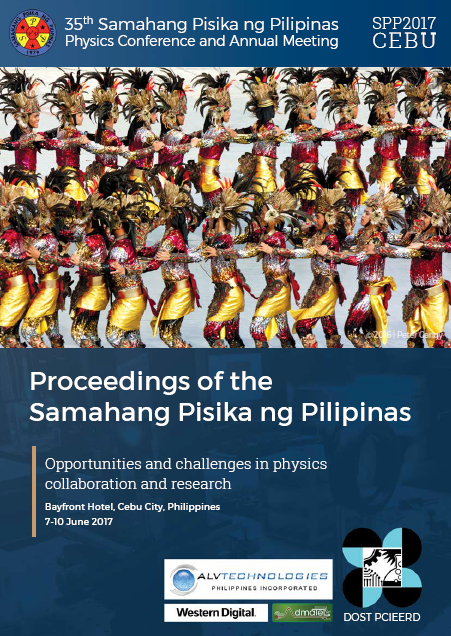 The potential of an unused Pu-Be isotopic neutron source for detection of gold by neutron activation analysis, Proceedings of the Samahang Pisika ng Pilipinas 35, SPP-2017-PA-10 (2017). URL: https://paperview.spp-online.org/proceedings/article/view/188.